Like most little boys, Philip loved to explore his world, play in water, climb on things and follow his big sisters around. At a year and a half, he was smart and eager to try new things. He loved balls and airplanes, his bath, Elmo, the color green and silky things to caress while he sucked his thumb to fall asleep. Before our big family vacation this summer, the last time I'd seen him he was in May, and he had only a few words in his spoken vocabulary. But at the lake in early August, he quickly learned to call me Gamma and would call out to me, then grin when he got my attention. I also enjoyed quiet times with him snuggled against my chest as I rocked him to sleep. I was looking forward to a trip to New York to visit Philip, his sisters and his Mom (my daughter) at the end of September when I got a heart-stopping phone call from my daughter, Lori. Philip had been at the park, had been hit in the head and airlifted to the hospital unconscious. She had been at work and was on her way to the hospital when she called. I later learned that it had been an unsecured chain link gate left leaning up against a wall that toppled over and crashed down on Philip. In a heartbeat, life in our family had been dealt a blow we will never fully recover from. As I scrambled to find a flight to New York, I prayed, no begged Jesus to reach out and heal this sweet little boy. But Philip died in the dark hours of the early morning despite all efforts to save his life. My mind screamed in protest. NOT AGAIN! Please God, not again! 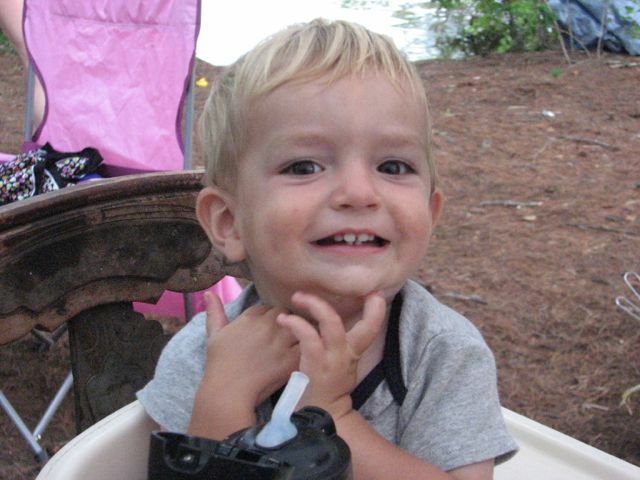 Seven years ago, my son's little boy Sam died of SIDS at five months of age. The reasons for these two precious children being rushed to the hospital were very different, but the vigil that followed, the prayers and pleas from parents, grandparents, sisters, friends, aunts, uncles that went unanswered as their little bodies began to fail and tests revealed there was no hope of recovery were eerily the same. It was a nightmare that just wouldn't end. We all wanted to wake up, but there was no waking up from the heartbreak and loss. The unthinkable descended on us once again. Philip's funeral was hard. Just about the hardest thing I've ever borne save Sam's. When my husband died of cancer, I could comfort myself in my grief and loss with the knowledge that Cal was at peace after fighting a long and difficult fight. When my mother passed away, I could rationalize it with the knowledge that she had been spared the worst that Alzheimer's can inflict on its sufferers. But with Sam and Philip there were no thoughts, no words, nothing to make it easier to bear. Two beautiful little boys, at the very beginning of their lives, gone in the blink of an eye leaving their parents stunned and devastated. As a grandmother, I cried buckets for the loss of two very much loved grandsons. I will never see them grow into manhood or celebrate all the things that should have been a part of their lives. I won't have their childish artwork decorating my refrigerator, nor pictures of them growing older scattered about my house. I will never rock them to sleep again, or get sticky kisses, then eager boyish hugs. There is so much I will miss. But the hardest part of all is looking into the eyes of my own child and seeing the immeasurable pain and suffering there and knowing there is absolutely nothing I can do to make it better. I can kiss their tears, hug them tight, pray for them and listen when they need to talk. But I can never give them back the thing that they loved most. Nothing I have lived through has ever been this hard. Anita, that was such a horrible experience for you all to go through, and the story was very moving. I can't imagine, and hope I never find out, how heart-wrenching the ordeal was. Someday they say we will have the answers to why. Right no, there are none. Just pain. You all are in my prayers. I keep remembering the Scripture where Jesus states that unless we become like "this little child" (as he drew a small child into his arms) we cannot enter the kingdom of heaven. I understand the context of the passage, of course, but thinking of Philip entering the kingdom of heaven in Jesus' arms fills me with awe. You and your family are in my prayers. You are loved.